Is Sony Corporation (NYSE:SNE) Going to Burn These Hedge Funds? Many investors, including Paul Tudor Jones or Stan Druckenmiller, have been saying for a while now that the current market is overvalued due to a low interest rate environment that leads to companies swapping their equity for debt and focusing mostly on short-term performance such as beating the quarterly earnings estimates. In the fourth quarter, many investors lost money due to unpredictable events such as the sudden increase in long-term interest rates and unintended consequences of the trade war with China. Nevertheless, many of the stocks that tanked in the third quarter still sport strong fundamentals and their decline was more related to the general market sentiment rather than their individual performance and hedge funds kept their bullish stance. In this article we will find out how hedge fund sentiment to Sony Corporation (NYSE:SNE) changed recently. Is Sony Corporation (NYSE:SNE) a splendid investment today? The best stock pickers are betting on the stock. The number of long hedge fund positions improved by 3 in recent months, and the company was in 27 hedge fund portfolios at the end of the third quarter. With 27 smart money investors long the stock, Sony Corporation wasn’t one of the 30 most popular stocks among hedge funds. In today’s marketplace there are a lot of metrics stock market investors use to evaluate publicly traded companies. A pair of the most under-the-radar metrics are hedge fund and insider trading signals. We have shown that, historically, those who follow the best picks of the best hedge fund managers can outperform the market by a superb amount (see the details here). Now, it’s time to go over the latest hedge fund action regarding Sony Corporation (NYSE:SNE). How are hedge funds trading Sony Corporation (NYSE:SNE)? Heading into the fourth quarter of 2018, a total of 27 of the hedge funds tracked by Insider Monkey held long positions in this stock, a change of 13% from one quarter earlier. 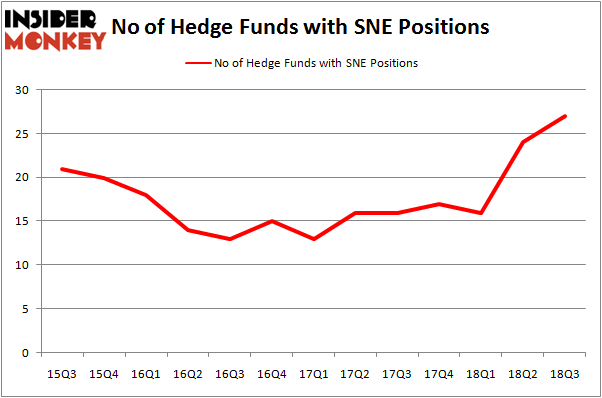 On the other hand, there were a total of 17 hedge funds with a bullish position in SNE at the beginning of this year. With hedge funds’ sentiment swirling, there exists an “upper tier” of key hedge fund managers who were upping their holdings considerably (or already accumulated large positions). When looking at the institutional investors followed by Insider Monkey, GAMCO Investors, managed by Mario Gabelli, holds the biggest position in Sony Corporation (NYSE:SNE). GAMCO Investors has a $257.6 million position in the stock, comprising 1.7% of its 13F portfolio. On GAMCO Investors’s heels is Soroban Capital Partners, led by Eric W. Mandelblatt and Gaurav Kapadia, holding a $92.6 million position; the fund has 1.4% of its 13F portfolio invested in the stock. 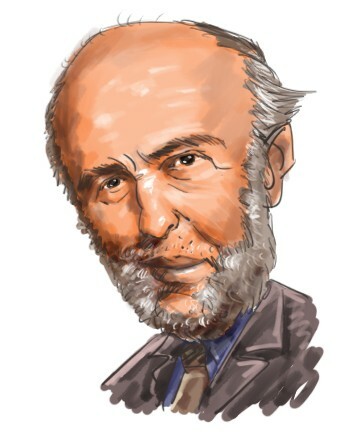 Remaining hedge funds and institutional investors that are bullish contain Jim Simons’s Renaissance Technologies, Jonathon Jacobson’s Highfields Capital Management and Fang Zheng’s Keywise Capital Management. As aggregate interest increased, key money managers have jumped into Sony Corporation (NYSE:SNE) headfirst. Soroban Capital Partners, managed by Eric W. Mandelblatt and Gaurav Kapadia, established the most valuable position in Sony Corporation (NYSE:SNE). Soroban Capital Partners had $92.6 million invested in the company at the end of the quarter. Dmitry Balyasny’s Balyasny Asset Management also initiated a $15 million position during the quarter. The other funds with brand new SNE positions are Zach Schreiber’s Point State Capital, Charles Davidson and Joseph Jacobs’s Wexford Capital, and Jeffrey Talpins’s Element Capital Management. Let’s now review hedge fund activity in other stocks – not necessarily in the same industry as Sony Corporation (NYSE:SNE) but similarly valued. These stocks are Vale SA (NYSE:VALE), Starbucks Corporation (NASDAQ:SBUX), Danaher Corporation (NYSE:DHR), and BlackRock, Inc. (NYSE:BLK). This group of stocks’ market valuations match SNE’s market valuation. As you can see these stocks had an average of 40 hedge funds with bullish positions and the average amount invested in these stocks was $1.75 billion. That figure was $709 million in SNE’s case. Danaher Corporation (NYSE:DHR) is the most popular stock in this table. On the other hand Starbucks Corporation (NASDAQ:SBUX) is the least popular one with only 33 bullish hedge fund positions. Compared to these stocks Sony Corporation (NYSE:SNE) is even less popular than SBUX. Considering that hedge funds aren’t fond of this stock in relation to other companies analyzed in this article, it may be a good idea to analyze it in detail and understand why the smart money isn’t behind this stock. This isn’t necessarily bad news. Although it is possible that hedge funds may think the stock is overpriced and view the stock as a short candidate, they may not be very familiar with the bullish thesis. In either case more research is warranted.